The above photo of a Tufted Duck was not taken here in Australia, but in Europe by myself. However, there have been a lot of photos taken of the Tufted Duck that is currently in Australia. 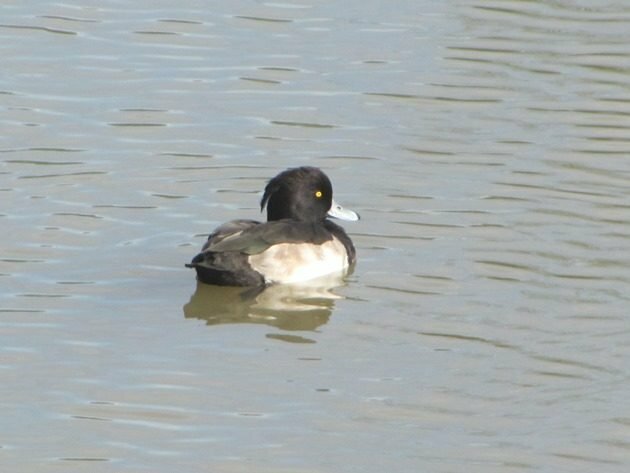 It is very disappointing that this Tufted Duck overshot the north of Australia and ended up at the Western Treatment Plant at Werribee, which is 30 kilometres/19 miles west of Melbourne. The Tufted Duck was first discovered by an American birder, Mr Michael Dougherty, on January 3rd and it is still being discussed on the news this week. Apparently this Tufted Duck is being called a “Goth Duck” in New York already! There’s no denying really that “our duck is better than your duck”! The Western Treatment Plant, which of course means “Poo Ponds”, is Victoria’s premier birding site and access is restricted to birders. You need to apply for a permit and it comes with conditions. There are no restrictions on birds visiting and hence the arrival of one lone Tufted Duck! There have never been Tufted Ducks in zoos or other wildlife parks in Australia and so we can only assume it got completely lost. The Tufted Duck is believed to be a first year male bird and is several thousand kilometres from the closest record to the north. With the current heat wave across Australia it has become harder to observe the Tufted Duck. Huge numbers of ducks are congregating at the ponds to escape the heat and there have been birders there every day searching to tick it off their Australian Bird List. Several birders have been able to capture photographs of the Tufted Duck and upload them to eBird. Now, unlike the Mandarin Duck that was dropped in Manhattan’s Central Park this duck does not have any bands on its legs. I am not aware of any of the 10,000 Birds Beat Writers from Europe sending a Tufted Duck our way. If one of them did send the Tufted Duck then I am disappointed that it did not get good directions to Broome! Meanwhile I will continue to add birds to the 2019 Year List and if we do happen across a Tufted Duck locally I will be sure to let you know! As a bird flies, if it flies straight, it is only 3000 kilometres/ 1865 miles to Broome from the Western Treatment Plant on the way north back to Europe, so never say never! Surely this Tufted Duck has some friends? Surely it is not travelling alone to Australia? Maybe a small flock of Tufted Ducks split up over the north of Australia? Maybe I need to get away from the computer and start checking our local Poo Ponds for Tufted Ducks!